New Yorkers constantly build on their base. I saw lots of evidence of that with cycling over this past weekend. First, in Manhattan, bikes were ubiquitous. The felt sense was much more than Cambridge, more like Cambridge, England. Big, cross-town bus stops had commuter bike racks under the roof. The city has huge biking maps there as well. More impressive were the relatively new and still irritating to some separated bike lanes. 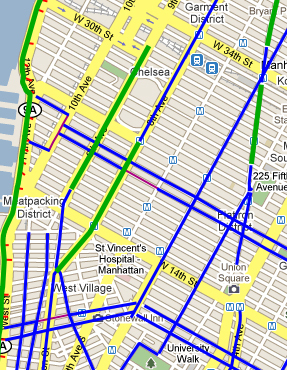 The map piece here shows those in green, as on 8th Avenue (going uptown) and 9th (downtown). Pix click trick: Click on a thumbnail for a larger view. If this opens in the same window, use your browser’s back function to return. New York boroughs tend to have spacious avenues, which offer the option of simply stealing a full travel lane. A few U.S. cities, like Washington, D.C. and Columbia S.C., were planned like that and do as well, but we aren’t here. Once the city had its hearings and planning, it went ahead. Like many big European cities, it simply moved or took parking and travel, devoting it to pedestrian and cycling. We don’t yet have the will and courage for that. Note the separation in the pic below. You can see the concepts and diagrams in the design doc here. It gives a 10-foot lane for bikes (actually a 5-foot travel lane with a buffer road space on each side. There is a median or other physical barrier between motor vehicular traffic and another for pedestrians. Everyone is safe. Everyone has his own lane. 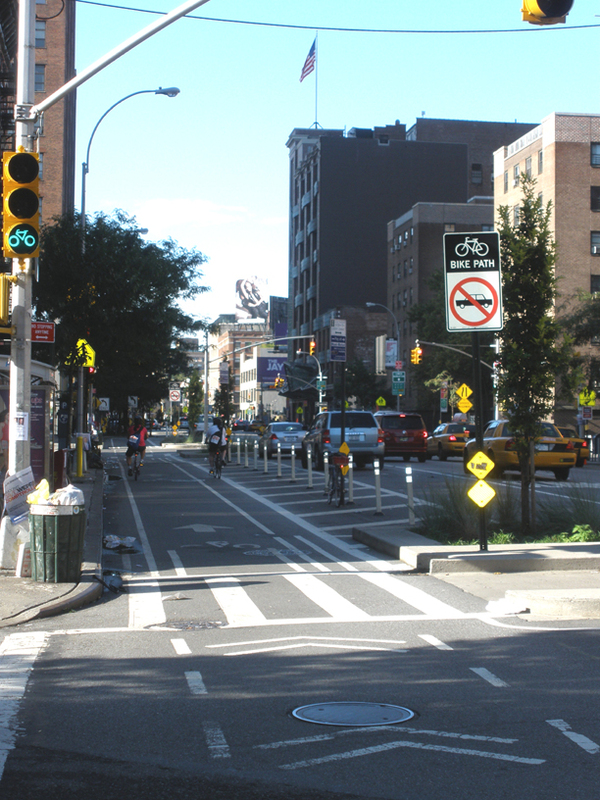 Numerous NYC blogs whine (here for one example) about not having enough such lanes yet. They have that NY urgency. There’s also lots of info about biking in the city, including these lane here. Of course, not everyone is pleased, even where there is lots of physical space on a broad avenue to do this. At the top of pissed pyramid would be merchants on 8th Avenue. Near that are the delivery truck guys, who either have to circle the block to find parking spaces (which do exist on the avenues), risk a $115 ticket for driving in and blocking the bike lane, or push their loads across the street. For the truckies, this was similar to the crackdown about 30 years ago. When the police responded to thousands of complaints of blocked cross streets by giving tickets for double and triple parking, it was to be the end of the world. They adjusted and traffic has flowed since. Similarly, a wonderful piece in Chelsea Now, a local weekly, shows the level of complaint here. Some merchants are just sure they are losing business or that their costs have to have gone up. It’s all apocryphal. There are no numbers to back that up, even though they would be very easy to gather. I can see them not wanting change, but they’re going to have to do better than it’s-only-common-sense. That’s what people say when they can’t prove their contention. Such ped/bike/motor separation is not an NYC invention. It worked well and first elsewhere. There, they had the space and the will. I have no doubt that even as early as mid-term, all modes of transportation will be fine, just fine with it. Even the store owners will realize they are not harmed. As for Boston, we don’t have a lot of places to do this. We could on Tremont where it changes from Cambridge and goes past the Common, but in most places, we’d first have to lay down another lane for the ped/bike/motor separation. On the good side, we are inching that way. Even the three guys contending to unseat Mayor Tom Menino share the big man’s affection for more bikes and fewer cars. I think of the new, narrow bike lanes painted for a short distance on Columbus Avenue here. Eleven days ago, I took it both ways. In that short distance, I counted 22 motor vehicles blocking the lane, 9 one way and 13 back. Of course, there was no enforcement. Bikes had to take the single lane in either direction from cars and trucks to move instead. The equivalent to 8th/9th Avenue would be to create that separation in one direction. Then another street, like Tremont in the South End and Roxbury would go in the other direction. Set up the physical barriers and voila, safe separation. What did Bob the Builder ask — can be build it? Sure we can.